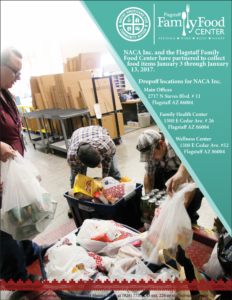 NACA Inc. and the Flagstaff Family Food Center have partnered to collect food items through t he rest of January. The three donation bins are set up near the Front Desk window at the Family Health Center, under the flat screen television in the Wellness Center, and at the water refill station at . Envelopes have also been provided to make a monetary donation if desired. CLICK HERE or on the flyer for more information.